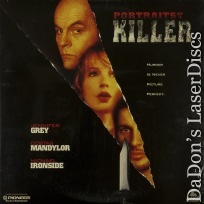 Portraits of a Killer 1996 - 93 min. - Color Genre: Thriller Rated R Country: USA LaserDisc Movie Storyline: When attorney Elaine Taylor agrees to defend a murder suspect, she doesn't expect to have a close personal relationship with the accused. But, unfortunately, she's fallen for her client, and finding it hard to remain objective and professional. Now she has to depend on the detective who investigated the case to help her keep her sanity... and maybe even her life.